I thought i'd take advantage of my free time a couple of weekends ago and do something productive. There are a few pieces of super old bedroom furniture that have been sitting in our garage for as long as I can remember. My mum and dad inherited them from my Great Great Aunt (I think!) about 20 years ago and apart from being very grubby and a bit battered they were in surprisingly good condition when I finally managed to unearth them from their cobwebby corner. After discussing the whole idea of giving the bedside tables a new lease of life with a guy at work I discovered you could purchase what could possibly be the best 3 things EVER. Spray Primer. Spray Paint. Spray Varnish. Who knew?! … Anything that means pretty much no cleaning up time is a winner for me, so after a quick trip to B&Q and armed with my trusty aerosol cans and a few sheets of sandpaper I was good to go. 1) Wash Wood - My tables were very grubby, so I gave them a quick wash down before doing anything, unless yours are of a similar state i'd say you can go ahead and skip this part! 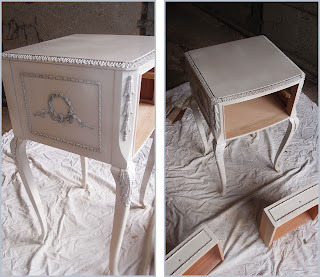 5) Prime Wood with handy spray primer - So simple! … Just follow the instructions on the can, mine said to hold the can 30cm away from the surface and spray in back/forth motion. Basically just keep the can moving! It only took about 15 minutes between coats so really isn't very time consuming going for a couple! 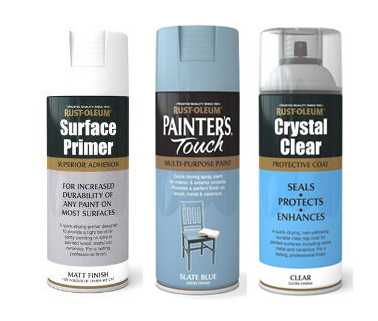 7) Paint Wood with handy spray paint - I went with Rust-Oleum Slate Blue. As with the primer I gave mine a couple of coats, pretty much the same technique, just keep the can moving and make sure you get in all the gaps! 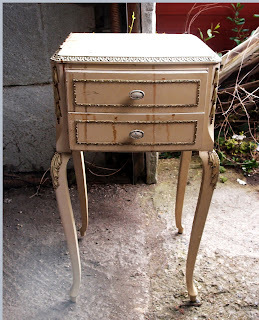 I also bought some metallic gold spray paint for the drawer pulls which came out lovely and shiny! 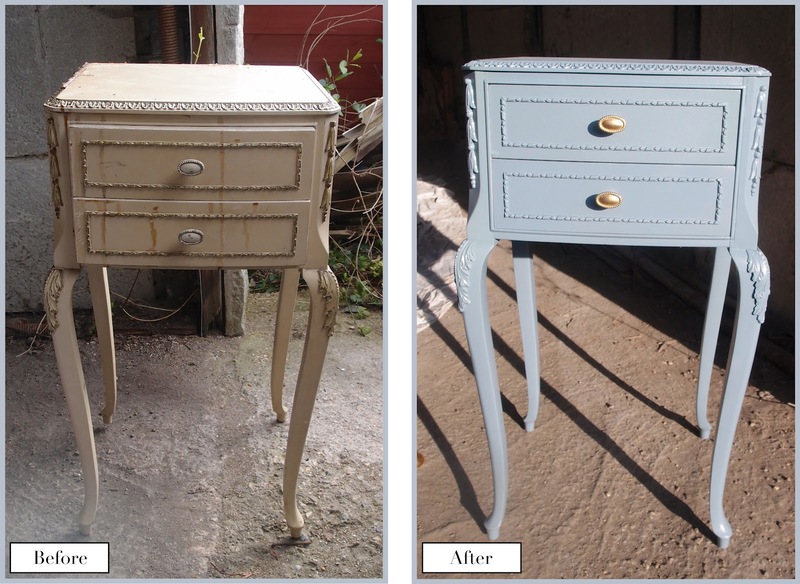 The only problem I encountered is that after spraying one of the tables I realised i'd need another can of paint to do the 2nd, and on returning to B&Q they had sold out of my colour… So i currently have one beautifully finished bedside table and one who is still awaiting it's Slate Blue coat. A job for my day off next week! I really do recommend this to anyone, it was about 10 times easier than I was expecting and the results were absolutely amazing! I'm so so happy with how it's turned out.